A frame that keeps the load from shifting like dead weight while hiking almost doubles your efforts when hauling stuff around the campsite. I find it’s especially tiring getting a long, tall weight like that in and out of the canoe. There are some portages that are less tiring than unloading my hiking pack from the canoe. The padded hip-belts (so great when hiking) snag everything they can, and you have to flip and curse and wedge the frame into place, in and around the thwarts. So I decided to make a purchase to test the waters, so-to-speak. I decided to replace one my frame packs with a Duluth-style pack. It’s essentially a big envelope of canvas, as simple as possible. The advantages of this design are obvious. The soft bag will fit into the contours of the canoe better. 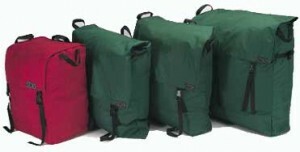 The bag is easy to pack and access, and since it’s likely standing up in the canoe. Keep some snacks or extra sunscreen in the pack, and a water filter pump, and you’re good to go. I recently took the plunge and ordered a proper canoe pack from Cooke Custom Sewing, and I’ll have the review and my impressions for you shortly. « Sorry about the lack of updates, they’re coming soon!